German manufacturer Tune updates its hub range this year. This Mag170, 2011 version hits the scale with 172g. A 17mm aluminium axle is fitted into the aluminum shell that now receives three 6803 bearings and a 6903 instead of the 6802/6902 bearings of the former Mag180/15mm axle. 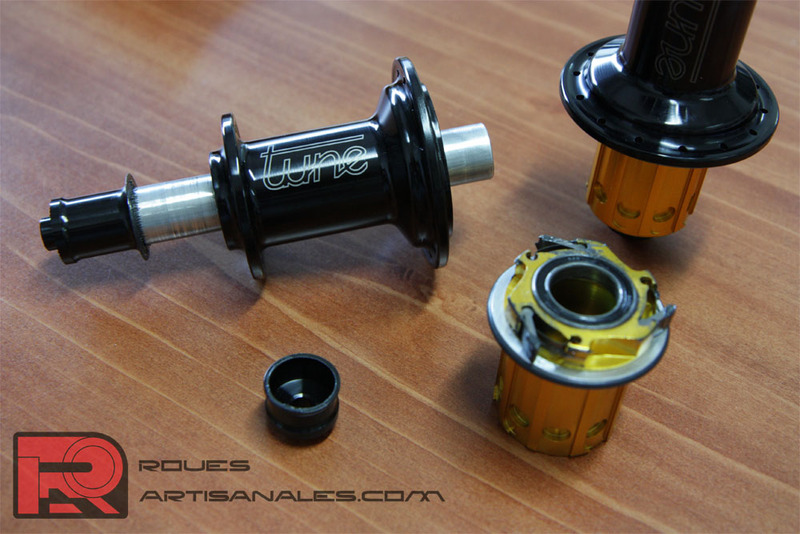 The new was spread at the Eurobike 2010: the hub range would receive larger axles and they should weight a little less. The name change was however not expected so it seems like the final weight save exceeds the original. Obviously all the hubs of the range should benefit of this modification to standardize the parts of the mechanism. We can differentiate quickly this new Mag 170 from the former Mag180 by the color of the freewheel that is gold instead of red. Both end tips are black. The latest production versions receive a blue freewheel. 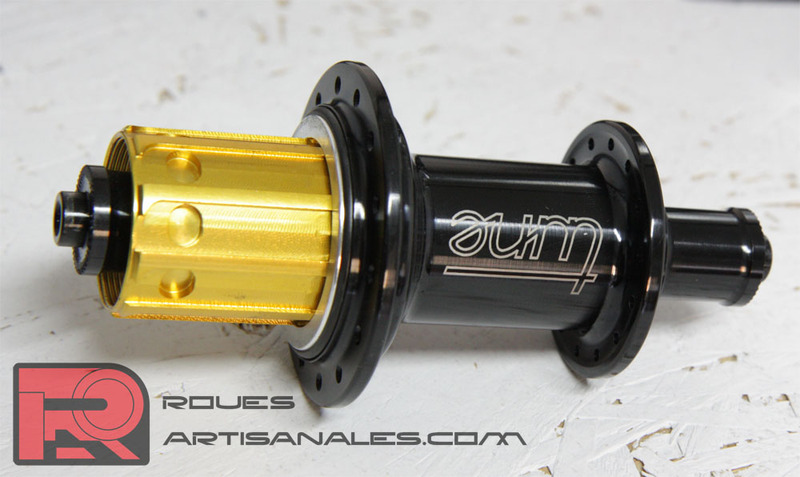 This new Mag170 hub features a newer geometry. Indeed the spacing between the center of the hub and the non drive side flange is lower than its predecessor: 35mm instead of 39mm. The flanges diameters and the drive side flange spacing remain the same. 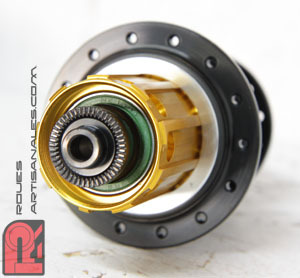 This more compact shell will favors the spoke tensions balance on both sides of the rear wheel. Then, the diameter of the central part of the shell is 3mm larger than before. The Mag180 shell had a diameter of 28,3mm, this Mag170 is 31,6mm. Regarding the bearing pre-load, Tune abandons the former system. This former system pre-loaded the bearings through a end nut screwed on the axle and pushing on a small rubber O ring. On the latest version, the system is as simple as a end cap pressed onto the axle just like the Mag150 and Mag160 of the range, but also like the DT Swiss and Powertap hubs for example. Tune hubs genealogy is quite tricky for those who didn’t follow since the early days. For your information, this newest Mag170 that is the successor of the Mag180 (2007), itself successor of the Mag190 (2005) and Mag200 (2002), must not be mistaken for the 2002/2004 years Mag170 that was a 15mm carbon axle hub. This old Mag 170 was the predecessor of the current Mag160. The picture below illustrates the different hub geometries we can encounter. Proudly powered by Roues RAR.